This month we're having a sit down chat with industry expert Chaplain Major Andy Shepherd. We're continuing our discussion on how to Master Difficult Conversations with Dignity. With over 20 years of service in the United States Army, commissioned officer and chaplain, Andy Shepherd knows a things or two about difficult conversations! How do you handle difficult conversations? To tell the truth, most people don't handle them well. In fact, few people enjoy having difficult conversations, but it's something that has to be done at some point. Where it might come naturally for some leaders, mastering difficult conversations is something the majority of leaders will need to continuously work on and develop. Join me on October 15th for a few quick tools that will help you with difficult conversations and allow you to create lasting, productive relationships with your team. We're sitting down and chatting with entrepreneur Jamison Gavin. Gavin started, grew, and sold his first company before the age of 27. 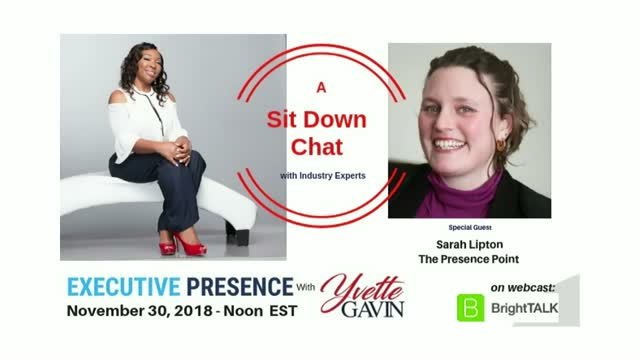 In this chat with host, Yvette Gavin you'll learn the key components of Gavin's early success and how the skill of connecting contributed to his ability to grow a company within three years with a valuation worth millions. First time sellers and small business entrepreneurs often aren’t comfortable with sales. Many say selling their products and services makes them feel pushy. It takes on the average about seven second to make a first impression. If the feeling is ‘I don’t want to be pushy,’ you’re most likely not going to make a great first impression with a potential client. But, when we make a great first impression clients are more likely to take your small or big business seriously. Join me for a talk on how to sell and seal the deal. I will share with you tips on how to get from A to Z and attract investors, top talent and close the deal by leading with executive presence and connecting. We all need people who can help us sharpen specific strengths or navigate through certain environments and problem areas. Whether it’s our professional careers, marriages, parenting, spiritual growth, personal disciplines, or hobbies, a mentor can make the difference in marginal success and major success. Yet, all mentors are not the same. How do you find a mentor and better yet, how to find the BEST mentor for you? Where there are incredible benefits associated with mentoring, choosing the wrong mentor can be damaging to your career and personal life. To gain the most out of a mentoring relationship, you must be selective in who you choose as a mentor. Regardless of the profession, how well you communicate with either make or break your professional image. How you communicate directly influences how others view your work and performance—as well as your prospects for career advancement and mobility. Executive presence is not about a title, it is about influence. Our webcasts are for professionals who are committed to growing their influence personally and professionally. The leadership insights shared by Yvette and her guests will help others to elevate their careers and impact their communities. Informative and conversational, we've designed interactive webinars with you in mind. Have a leadership question? We're here to answer your questions or help you find the answer. We're committed to engaging you throughout the webinar and not just running through a stack of slides. Our goal is to provide practical information that will enhance you and your professional presence. ABOUT US: Yvette Gavin is the owner of Yvette Gavin Consulting where she's teaching others how to elevate their careers while remaining authentic. Before completing her college degree, Yvette successfully navigated her own career from a newspaper reporter to an Information Technology director. She has helped others who were feeling stuck and lacked direction to elevate their careers and gain greater success. Executive Presence with Yvette Gavin webcasts are ideal for professionals who desire to lead strong by increasing their influence while remaining authentic.